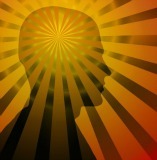 Best Energy Drinks & Foods for Brain Focus, Alertness on the Job? for Brain Focus, Staying Awake and Alert? Do you need more will power for cravings or a weight loss diet? Did you know that you’ll have LESS will power after grabbing -- a candy bar, sweet treat or a soda -- for a quick boost? Do you know what your brain needs for you to do the "right thing" and not be tempted by the fast boost from a soda or a candy bar? Researchers have found out which foods help you stay ALERT, SMART and with MORE WILL POWER! Did you know that you’ll get MORE will power by eating real food, and by drinking herbal natural energy drinks than by eating a candy bar or a convenience sugar/caffeine drink? But here’s why a sugar drink or sweet does NOT work in the long run! Yes, researchers have found that eating candy or a candy bar improves mental performance for a while, for instance, before an exam, because of the quick spike of glucose. So yes, this “quick fix,” works, but we don’t always grasp why it does NOT work for long. Why? Unfortunately, not long after, glucose levels DROP dramatically, and we are then NOT able to focus! But it gets worse. Not only do you lose your focus, but you also lose your WILL POWER because of this drop in sugar! So, you no longer have to blame yourself totally for lacking will power. Read on to find out how to improve your will power! Less Will Power with Low Sugar? Yes! Researchers have found that a drop in glucose also stops us from being able to exert will power! So... you find yourself grabbing another candy bar or sugar drink, setting in motion a vicious cycle. It was Dr. Matthew Gailliot of Florida State University who found that people who were able to do one act of focus and self control did badly on the second and third tests. His research showed that people lost BOTH their concentration AND their will power with low sugar. This would not be good for any weight loss diet or a job that needs concentration and focus! Here's what Dr. Gailliot did. He studied people who were askedparticipants to do several tasks that needed focus and self control. One of these was watching a video of a woman talking, while words popped up in the corner of the screen. They were asked to ignore the words and just stare at the woman’s face, which is hard, because people automatically want to read the words. He found that most people were fine with the first test, but they did not do well in the tests after the first. Dr.	Gailliot discovered that their WILL POWER dropped at the same time that their glucose levels went lower, so that they no longer had the same self control. How to Avoid Ups and Downs? Slow and steady is BEST for your BRAIN! Slow-release glucose does not set us up for an eventual roller coaster of highs and lows. Why is slow-and-steady glucose better than a quick up and down spike? Starting by eating a fiber-rich breakfast e.g. oatmeal or bran, will deliver glucose over a longer period of time without the “spike” and eventual “downer” of a candy bar. 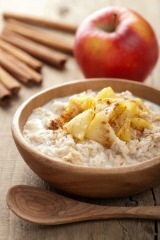 Simply eating a morning meal rich in fiber can make you more alert throughout the day. A study done at Cardiff University in Wales found that people who munched on cereal packed with 6 to 12 grams of fiber in the morning showed a 10% reduction in fatigue. "They also had fewer memory problems, fell asleep faster at night and were less depressed," says researcher Andrew Smith, a professor of psychology. Best Stimulants for Focus against Tiredness? The most common stay-awake stimulant is coffee, for alertness and performance – at least for up to 2 to 3 cups a day. Trouble is, that if you drink more than that, the effect levels off, and even reverses! Worried about caffeine when you buy energy drinks in the stores? •	Large doses of caffeine can cause the jitters, insomnia and anxiety. A LITTLE AT A TIME? A Harvard Medical School study found that a gradual intake of caffeine was best for helping sleep-deprived men do better on mental calculations and reaction-time tests. What's the best of energy drinks with a LONGER pick-me-up than coffee? Guarana is safer for natural energy drinks because its advantages over coffee. The boost from natural energy drinks with Guarana is not like that of coffee (with a sudden rush and quick drop-off), but continues over hours. XTRA SHARP herbal drink with Guarana relieves stress in minutes, improves alertness and concentration, fights fatigue as well as nervous exhaustion. Guarana has been SAFELY used for thousands of years in the Amazon region. It's been studied in clinical trials by the government and universities of Brazil -- the home of the AMAZON, as being safe and effective in recommended doses and does NOT have harmful side-effects. Neither is it habit forming and will not interfere with sound sleep if you take it earlier in the day, like coffee. Fight Fatigue in Minutes with NO-caffeine, NO-sugar with this month supply guarana herbal drink. Want a Fast Boost That's Good For You? Tired of caffeine and sugar pick-me-ups? 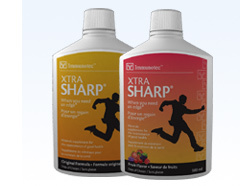 XTRA SHARP is a tonic to refresh and restore you physically and mentally by revitalizing your BODY and BRAIN! How? and an energizing assortment of herbs. Get a HERBAL TONIC DRINK that's safe for diabetics with NO SUGAR. •	Herbal tonics have been used traditionally in Europe to increase stamina, reaction speed, concentration and mental alertness. “When I took convenience store caffeine energy boosters I had to stop for more to visit the men's room. Now, with a shot of Xtra Sharp I can do better at planning my breaks! And it sure helps me focus and stay alert.” Jim C, Missouri, long-haul trucker. “As a nurse I do long shifts, and this herbal-mineral tonic helps me take care of my patients better because I stay focused, alert, and I am less tired.” Jane S., Oregon, Registered Nurse. "Xtra Sharp herbal tonic just gives me the get up and go to start my day and get on with life – I have more concentration – the tonic with guarana is the best pick-me-up I have ever taken." Karla G., Florida, shift worker. Want the best herbal ingredients in natural energy drinks? 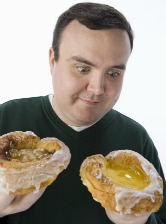 Fats & Cholesterol Make You Smarter? Because the brain is composed of approximately 60% fat, fats are extremely important for mental focusing, alertness and vigor. Eating fish oils and the essential fatty acids (EFA’S) in nuts and avocados has been shown to be crucial for concentration and focus, especially for children and people with attention deficit, ADD or ADHD problems. A study published in “Psychosomatic Medicine,” by Elias and Elias, found that as peoples’ cholesterol levels rose, so did their ability to learn, pay attention, remember and speak fluently!! So, for best focus, keep your “good” cholesterol levels up by eating fish, nuts and avocados. 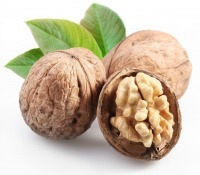 So have a bag of nuts on hand for a quick snack for long-term performance and alertness! What does Your Brain Need to Improve Memory? If you want after-lunch-pick-up, have the same lunch you feed your kid -- if it's a peanut butter and banana sandwich. Bananas pack potassium, a mineral your body needs to convert sugar in your blood into vitality, says expert Susan Lark, M.D. WHY IS PEPPERMINT A FAST PICK-ME UP? With PEPPERMINT, not only will you freshen your breath, you'll perk up your brain. In a NASA-funded study, scientists from Wheeling (W.Va.) Jesuit University, with 25 volunteers, they found that the smell of peppermint lowered fatigue by 15%, increased alertness by 30% and decreased frustration by 25%. Why? 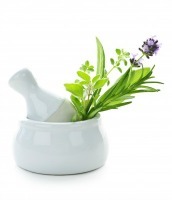 Oils in the peppermint plant increase alertness by stimulating your trigeminal nerve. This is "the same nerve that's activated when you revive someone with smelling salts," says Alan Hirsch, M.D., director of the Smell & Taste Treatment and Research Foundation in Chicago. For a quick pick-me-up, take a long whiff from your mint case, or stash a bottle of peppermint oil in your desk or purse. Or make yourself a cup of peppermint tea! Green tea is also a pick-me-up, although for some of us it is hard to substitute for our regular coffee! Green tea does have some energizing caffeine, but it also contains theanine, a compound that has a stress-reducing effect on your brain. "It calms you while giving you mental clarity," says Jacob Teitelbaum, M.D., author of From Fatigued to Fantastic! But make sure you get the best of herbal natural energy drinks XTRA SHARP in your car for night driving, or in your desk for a quick pick-me-up and FOCUS IN MINUTES! All you may need to recharge your batteries is something as simple as a swig of water. "A significant number of the people who come to me complaining of fatigue are actually dehydrated," says Woodson Merrell, M.D., executive director of the Continuum Center for Health and Healing at Beth Israel Medical Center in New York City. •	One study found just a 2% dip in hydration levels -- the point where you start to feel a little thirsty -- decreased short-term memory as well as the ability to add and subtract. •	Another study found that dehydrated exercisers tired out 25% sooner than those who sipped water during workouts. "One reason for the fatigue that is rampant in our society may be light deprivation," according to Michael Terman, who is the director of clinical chrono-biology at the New York State Psychiatric Institute in New York City. Research is showing that exposure to bright light in the morning can boost your energy-level throughout the day. One theory: Light stimulates neurotransmitters in your brain, such as serotonin and dopamine, which improve your mood and increase motivation. Exposure to any sunlight can provide a little boost, but Terman says that "the dawn signal has a particularly strong therapeutic effect." So take a morning walk or quick stroll during your coffee break; even a cloudy day offers enough light to have a stimulating effect on the brain. IF YOU ARE A SHIFT WORKER, avoid sunshine in the morning before going to sleep. Staying in the dark stimulates your body to make melatonin, the hormone that signals the body to go to sleep. Or... Refresh with This Mini Work-Out! Studies show exercise gets you a great boost, but who has time to hit the gym every day? Try this simple three-move “pump iron” mini-workout from Michele Stanten, "Prevention Magazine's" fitness director and co-creator of the "3, 2, 1 Workout" DVD. When men and women did each of these moves in one study, they felt up to 45% more energetic and refreshed after the workout, compared with a group who did not exercise. Note that you don't need to pump serious iron; the group that lifted lighter weights was actually more energetic than those who lifted heavier weights. Do five repetitions of each of the following exercises. Women should use 5- to 10-pound dumbbells; men should lift 15- to 20-pound weights. 1. Bench press. Lying on your back on a bench, hold dumbbells at chest height, palms facing toward feet. Press them straight up, then lower. 2. Overhead press. Stand upright, and hold dumbbells to sides at shoulder height. Raise them straight up over your head, then lower. 3. Bent-over row. Bend at the waist, keeping your back flat. With your arm hanging down, bend your elbow and pull dumbbell toward your rib cage. Slowly lower, then switch arms. ASK US about getting wholesale best energy drinks for a handy supply at home and at the office. Hope you will be inspired to get wholesale energy drinks with a month's supply in a bottle. Easy to put in your desk or your car.